Corporate venture capital has always been dubiously titled ‘dumb money’, supposedly less interested in financial performance and only willing to make bets on strategically aligned startups. CVC investing, however, has grown significantly over the past few years and many leading tech companies are diversifying their investments by operating autonomous VC funds that look more and more like traditional private VCs. In 2013, both the number and size of CVC investments has continued to rise. In October 2013, 48 venture funding rounds valued at over $719M included CVC investor participation. This represented a 14% participation rate, the highest month in the CrunchBase dataset. Past increases in CVC investing tend to correlate strongly to the business cycle, the overall strength of corporate balance sheets and the general VC climate. Thus, it should be no surprise that CVC investing has risen in 2013. The two most active CVC investors, Google Ventures and Intel Capital, have led the pack since 2011. In 2013, the two combined for 360 funding rounds, or 25% of all CVC investments. Compared to the CVC landscape prior to 2011, that is a huge departure from the biotech boom during which Johnson & Johnson, Novartis, GlaxoSmithKline, Kaiser Permanente, Amgen and MedImmune each participated in funding rounds that totalled at least $100M. 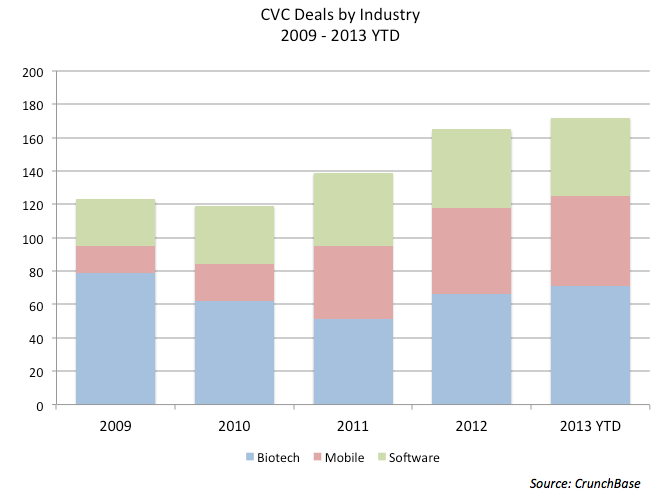 The 71 biotech deals with CVC participation in 2009 was a record high, while mobile and software CVC deals have risen consistently in each subsequent year. This is the main factor behind why the recent surge of CVC money might be changing the game. The trend towards more tech-oriented CVC investing now aligns more closely with the private VC landscape. In recent years, many large tech companies have followed in the path of Google and Intel. Microsoft, General Electric and Bloomberg have launched funds in 2013 that aim to focus on returns over strategic investments. Other corporate venture arms like Qualcomm Ventures, Comcast Ventures and Samsung Ventures have also recently participated in high-profile rounds for promising startups like Fitbit, Nextdoor and Pure Storage. While private VCs may be unwelcoming to an influx of corporate cash, successful companies can typically set up funds much faster and forego the normal SEC paperwork and outside fundraising, as evidenced by SAP Ventures recent launch of a $650M fund. Perhaps we will see more tech companies like Facebook try to emulate the success of Google Ventures and take advantage of a hot VC market. Regardless, it seems for the first time that corporate venturing is no longer an insurance policy for industry disruption or an R&D shortcut. To compare the relative success of CVC investors, according to CrunchBase a full third of venture-backed companies that have received funding from at least one CVC investor have been acquired, compared to just 10% of startups only receiving funding from private VC’s. However, this speaks more to the tendency of CVC investors to prefer later-stage investments in proven startups than it is a true measure of their investing prowess. CVC investors still prefer Series C funding rounds or later, but not quite as much as the past. Since 2011, 39% of all CVC deals were concentrated in later funding rounds, representing 65% of the total CVC funding dollars in that period. Not surprisingly, over half of total non-corporate VC dollars were spread among Angel, Series A and Series B rounds. 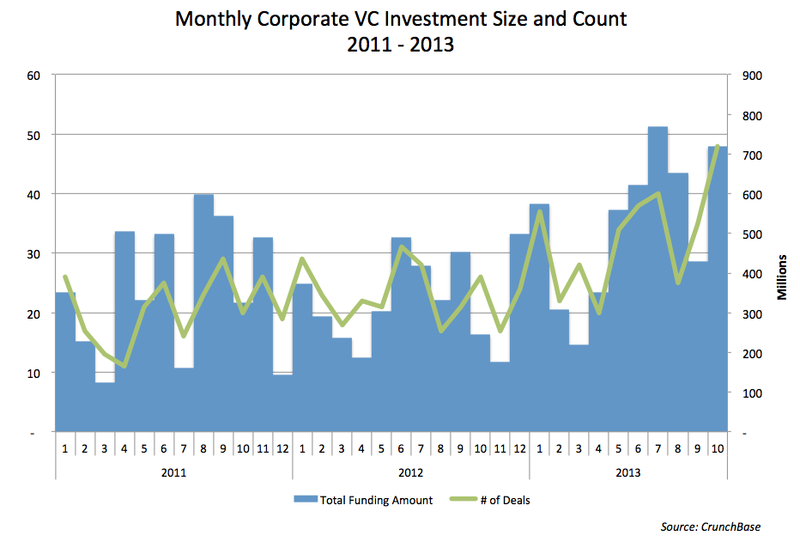 What has changed is the number of CVC Series A deals rising from 27 to over 100 in 2013 so far. As a ratio, Series A deals are at their highest level this year. CVC deals overall have also grown relative to private VC. The $17.4M average CVC deal size in Q2 2013 was more than double that of all other deals last quarter. So what can we learn from these recent trends in CVC investing? It’s important to keep in mind that the growth of corporate venturing is always subject to the strength of the balance sheet. 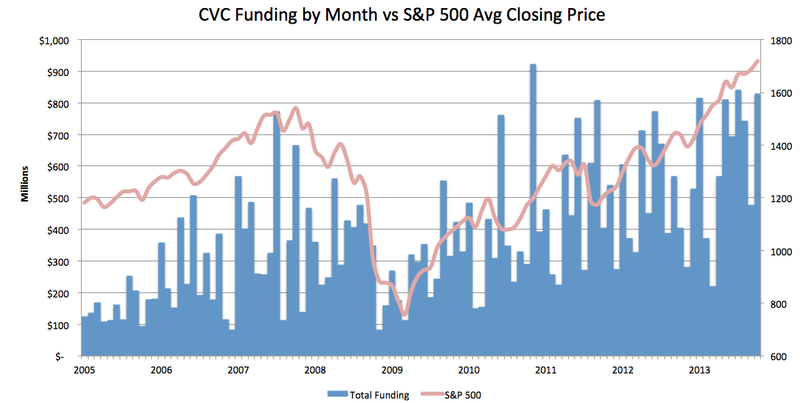 As seen below, funding totals of CVC rounds has closely tracked the S&P 500 since 2005. It’s also worth noting that according to a recent article in the Harvard Business Review Magazine, the median life span of CVC programs is only about one year. It may be easier for companies to set up VC funds, but it’s also much easier to pull the plug. Finally, there is an apparent gap in the corporate venture data* and recognition of what constitutes a corporate venture investment versus a direct corporate investment. Despite these factors, there is enough evidence to suggest that CVC dollars are no longer just ‘dumb money’. Startups seeking follow-on funding should be relieved that corporate investors seem to be stepping in and filling the Series A void. Private VC’s should also get used to the idea of investing alongside corporate funds and learn to get along. See for yourself what VC’s and startups are up to by checking out the latest CrunchBase October monthly data export. *The CrunchBase dataset includes all the top known VC entities set up by a corporate parent, in addition to venture investments by corporations without a specific VC fund like Amazon or Cisco that have participated in at least one funding round in CrunchBase.